China has been the world's number one carbon emitter since 2006. However, the country complains that developed countries' consumption of made-in-China goods is to blame for a big part of its CO2 emissions. It is true that China's export-driven manufacturing has led to dramatic increases in CO2 emissions. 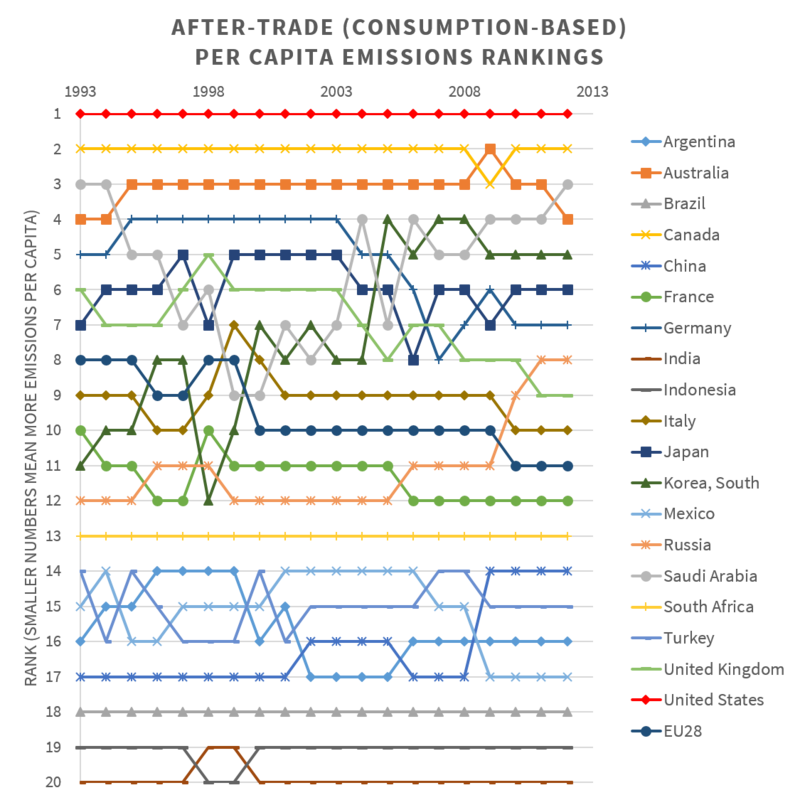 So a recent study (Le Quéré et al., 2014) analyzed how big the difference between before- and after-trade emissions in each country is. 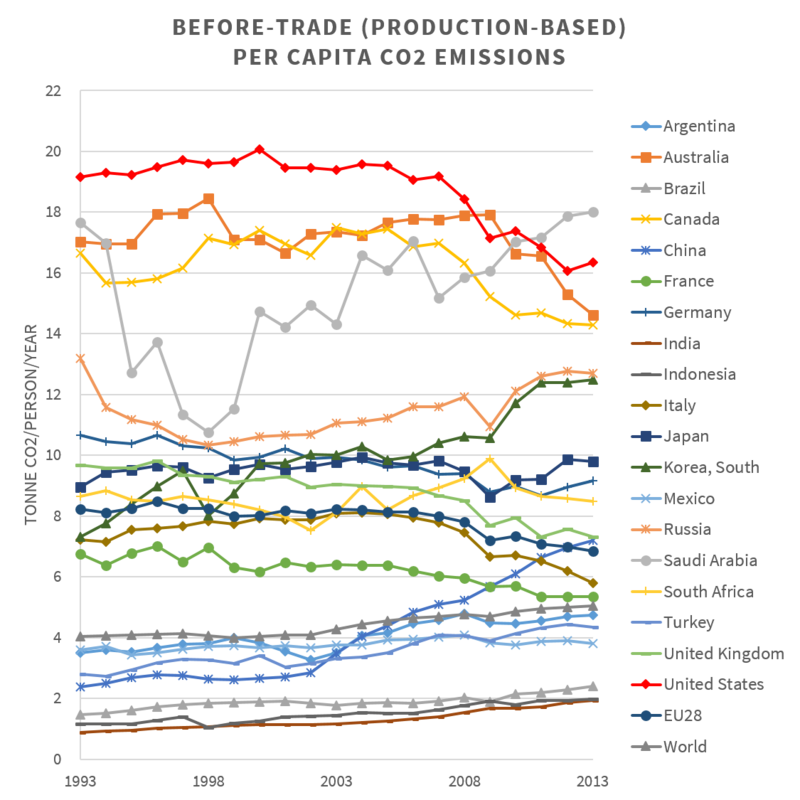 In those consumer countries such as the United States and the developed countries in Europe, the after-trade (consumption-based) CO2 emissions per capita should be larger than the before-trade (production-based) CO2 emissions per capita. Because I have compared energy intensities of G20 countries, I decided to compare the G20 members by their CO2 emissions per capita both in before- and after-trade terms. It was a simple task. I have divided each country's emissions (Le Quéré et al., 2014) by their population (UN DESA, 2013). The following figures show the results. Let's take a look at the Table below. In 2012, French people emitted 56% more CO2 by consumption-based (after-trade) emissions (8.32 tCO2/person/year) than that by production-based (before-trade) emissions (5.34 tCO2/person/year). China's per capita emissions decrease significantly using the same comparison. In 2012, Chinese people emitted 5.84 tonnes of CO2 per person by after-trade emissions, which is 16% less than the before-trade emissions (6.97 tCO2/person/year). (See also Figure 1 & Figure 2). How about comparing those G20 countries by rankings? Before the trade-adjustment (Figure 3), China ranked 17th among G20 countries by the production-based per capita CO2 emissions in 1993. In 2013, the country ranked 6th. 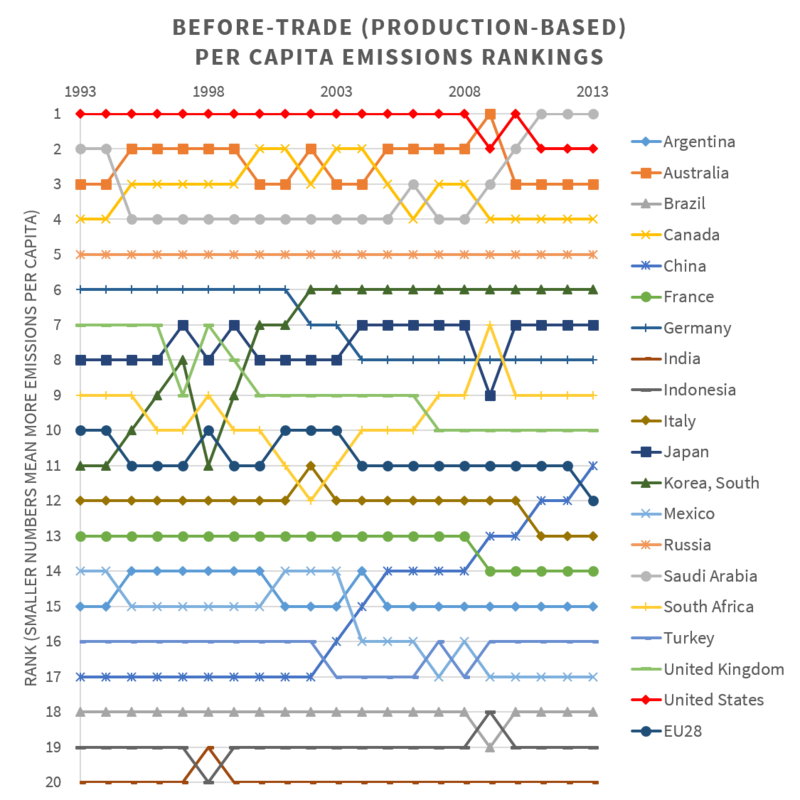 After adjusting the emissions by international trade (Figure 4), it is a different story. China was No. 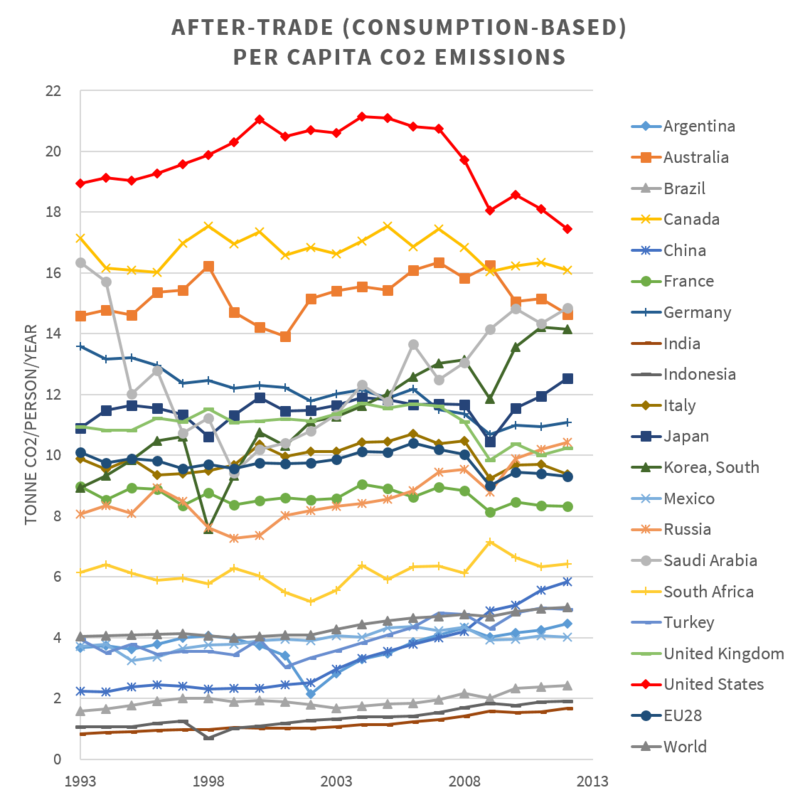 17 in 1993 by the after-trade emissions per capita. In 2012, it stepped up only three ranks (No. 14). By comparison, South Korea leaped up 6 ranks. It was No. 11 in 1993 before its rank rose to No. 5 in 2012. Russia beat China in terms of rank ascension. The country rose by 4 ranks from No. 12 to No. 8.